The third Anomia screening event will take place on Thursday, 25th of April in WORM’s cinema hall. Anomia is dedicated to showing artist films and videos that have existed within exhibitions, loops in space, discarded and appropriated material, PR stunts and documentations that relate to the artistic process. Throughout the evening we will screen a series of chosen pieces with accompanied snack breaks and good atmospheres all around. 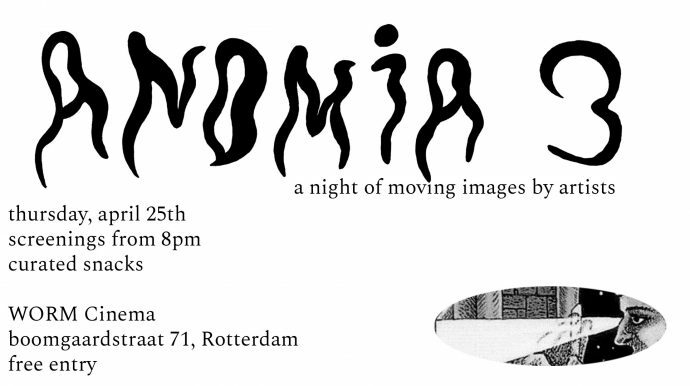 Anomia is organized by Bergur Thomas Anderson & Gunnar Gunnsteinsson, artists and co-initiators of At7 Project Space in Amsterdam.